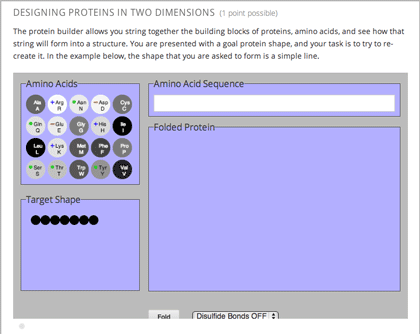 The Protex protein builder asks students to create specified protein shapes by stringing together amino acids. In the example below, the goal protein shape is a simple line. To create the protein builder, follow these steps. Under Add New Component, click Problem, and then click Blank Advanced Problem. In the component editor, paste the problem component code from the section that follows. Many protein sequences, such as the following example, fold to a straight line.You can play around with the protein builder if you're curious.